So the southern most tip of Argentina is actually an island, but we pretend it’s attached to the continent for fun. 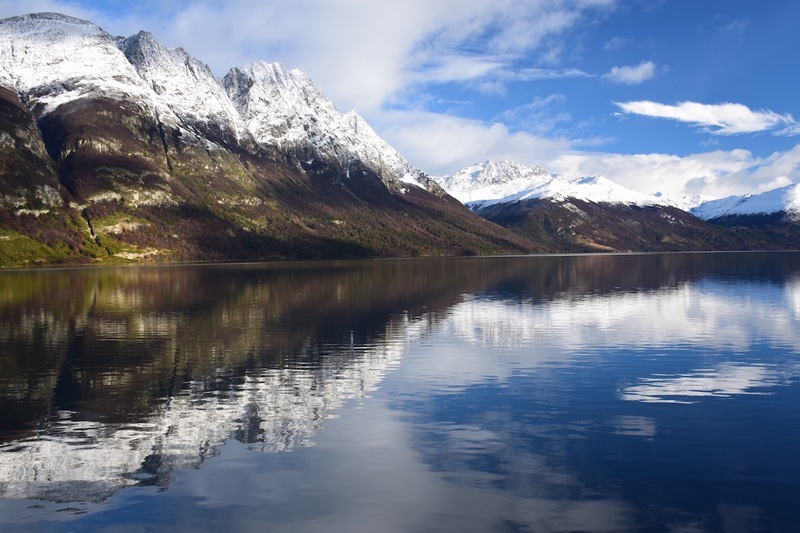 The whole area is called Tierra del Fuego and at the southern part of it, there’s a small city called Ushuaia. It is the southernmost city in the world (not including the stations on Antarctica, obviously) and just off the shores of the city, in Beagle Channel, is the world’s southernmost lighthouse. Ushuaia is proud of its status as the southernmost city and so it has lots of opportunities for you to take pictures with signs proclaiming that you’re at the “End of the World” or buy souvenirs that say “End of the World” on them. On our first day there we dropped by the information center to get “End of the World” stamps in our passports and take pictures with this end of the world sign. 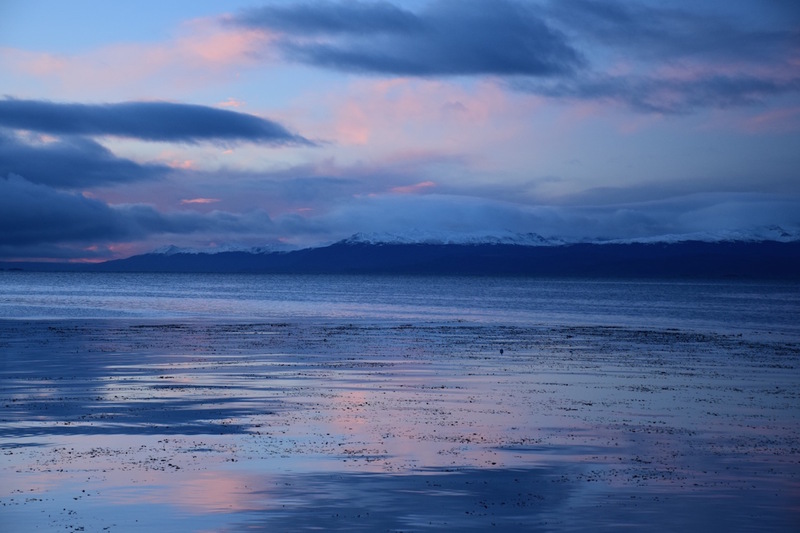 One of the big touristy activities in Ushuaia is to take a tour of the Beagle Channel. In the summer you can see penguins, sea lions, lots of birds and the aforementioned lighthouse. In the winter you can see all of this, minus the penguins. I guess even they get a little cold. 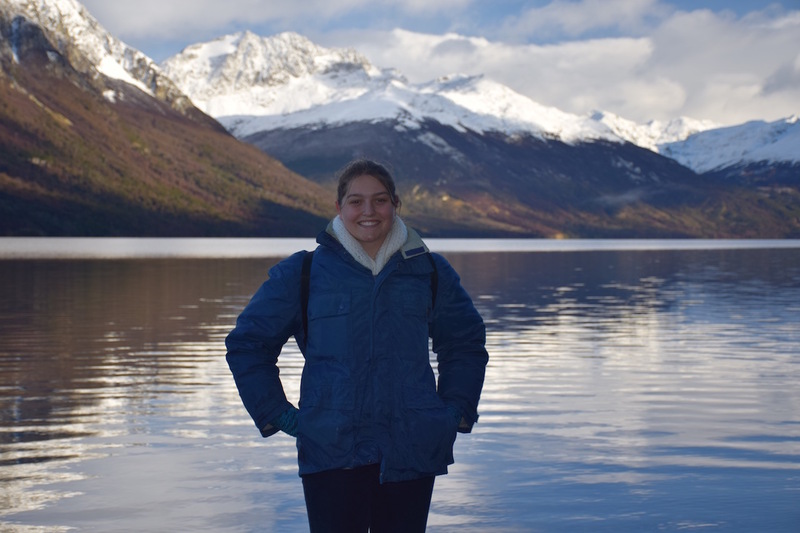 So with some advice from the hostel and our friends we headed out on a boat for a tour of the Beagle Channel which afforded some great views (I had to shrink my photos so that I don’t run out of room, if you want originals, just let me know). 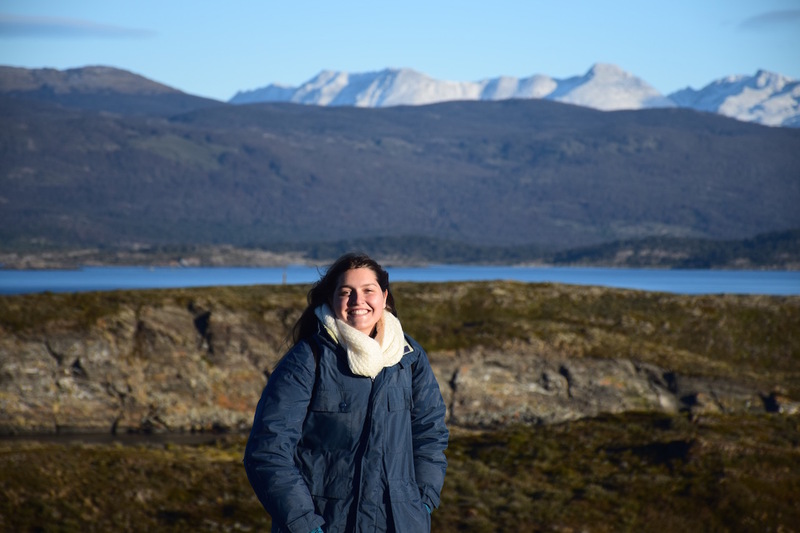 When we first arrived in Ushuaia, the mountains were all snow-capped, which as a child, I believed was the perfect way for them to appear so that little kids would know how to draw them. As I mentioned, we saw a ton of sea lions and cormorants on the tour, so I was glad that I remembered to bring my zoom lens. I got some pretty killer pictures of all of the animals, including this darling one of the sea lions. A second later the one on the right tried to bite the one on the left (which I also have a picture of) but they don’t they look so sweet? Living near San Francisco and having visited Pier 49 a lot, these guys weren’t anything new. My companions, however, were from the east coast and weren’t as familiar with sea lions as myself so they all died of laughter at the braying of the sea lions and the funky way they moved over the rocks. This is the oh-so-famous lighthouse. The southernmost lighthouse in the world, and according to my guide, it’s still functional! They do light it up every once in awhile and, to keep technology up to date, the lighthouse has a solar panel to power the light. I suppose it doesn’t take too much power to light a light; which is good, because they only get five or six hours of sunlight during the darkest parts of the year. We were getting a full eight hours while we were down there. The last part of our tour included a hike on one of the little islands to take a look around. It was super windy and cold, but the view was gorgeous. Because this part of Patagonia was settled so late, the communities have taken pretty good care of the environment and my guide told me that the surrounding islands were all part of a nature reserve and that they look today just as they did when Magellan first sailed through Beagle Channel. He also gave me a history lesson of the region in Spanish because I asked him for one, it was super informative. So this mountain looked really familiar to me and one of my companions finally put a finger on why after a good two hours of staring at it. It has a very similar shape to the Matterhorn! Who would have thought that would turn up here, right? It’s also just a really cool picture. Our second day there I decided to get up to see the sunrise. Or rather, to get out on time to see the sunrise. Because when breakfast at the hostel starts at 8:30 and the sun doesn’t rise until 9:30, it’s likely that you’ve been awake for awhile when the sun rises. I was glad I went out for it though! Because this was the only morning where we actually got to have an excellent sunrise, and it turned out to be very pretty. The mountains in this picture actually belong to Chile. After enjoying the sunrise we all took a shuttle over to the national park. This has pretty much been on my list since before I left so I was super excited to head out there. The views were absolutely gorgeous as we walked an hour and a half along a lake trail up to the border with Chile. It was pretty cold, but here I’m mostly wearing my jacket because I don’t particularly feel like carrying it. Did I say it was pretty or did I say it was pretty? I mean, come on? It’s gorgeous. 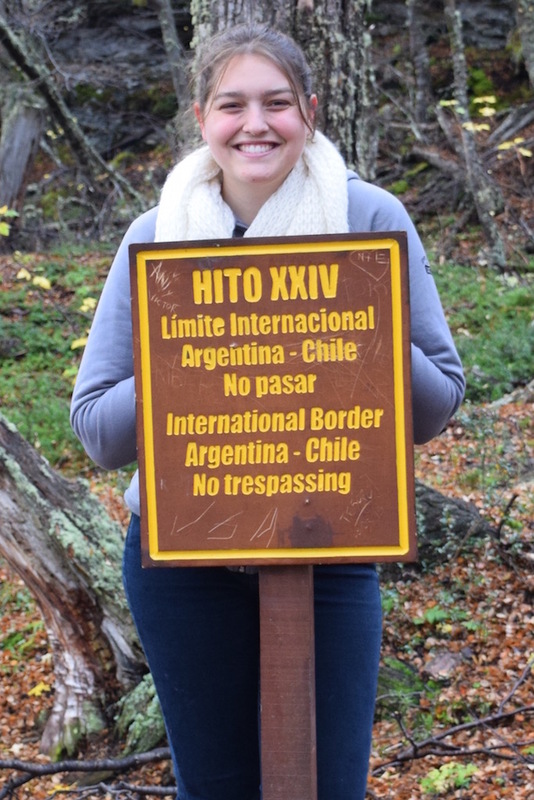 The end of our trail led us to the border between Chile and Argentina. Despite it’s warning that we shouldn’t trespass, being the rebels that we are, we had a nice little picnic about thirty feet past the border on the Chilean side. Because, you know, it’s not everyday that you get to eat lunch in Chile. Unfortunately it started raining during lunch and didn’t stop, so my pictures from the rest of the day are quite a bit gloomier. The rain didn’t stop and the next day, around 1pm it turned into snow. Unable to go hiking at the nearby glaciers with this dreary weather we headed downtown to check out some museums. The first was a museum about the four indigenous tribes who’d lived there before the europeans came along and accidentally killed most of them with smallpox. The Yamana tribe, pictured below, was the most interesting for us as they lived along the shores and didn’t wear any clothing. They generally adopted a crouched position to conserve warmth and had fires going pretty much wherever they went, including in their canoes. They also tended to be incredibly short, and, because they lived so much of their life crouched, couldn’t actually stand up straight. The second museum we went to was the museum of the prison that used to operate on the island. They attempted to build a penal colony where Ushuaia is in the very early 1900s and sent prisoners down to the island to build the prison and then live out the remained of their life sentences there. They turned the building into a museum with all sorts of different displays in each of the cells. They even had a couple of cells devoted to Las Mavinas which I was interested in, obviously. These cells were mostly devoted to the ships that were used during the Las Malvinas conflict, with hardly anything said about the conflict itself, however, the folks who live in Ushuaia feel very strongly about the islands. One whole wing of the prison was left as it was when the prisoners lived there so we were able to wander through, freezing to the bone, and see the tiny cells. 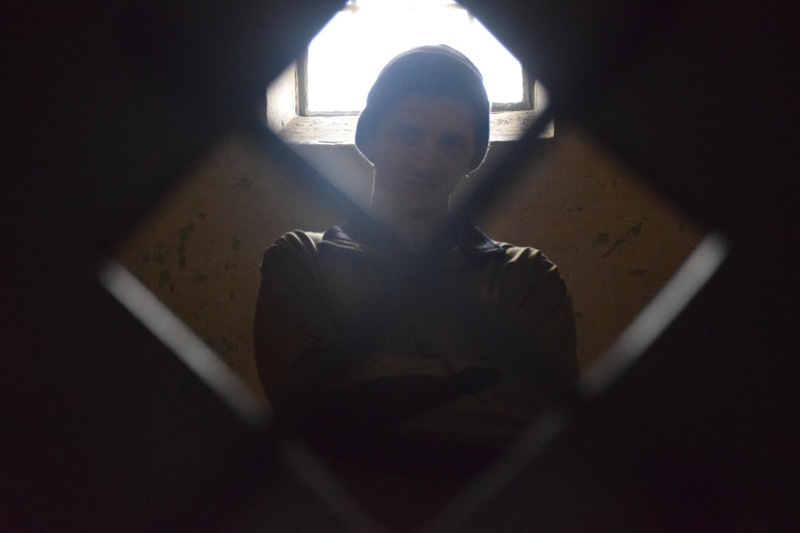 My friend went in one and I peeked through the bars to get a rather astonishing picture of him semi-glaring back out at me. Another wing of the prison was devoted to an art display by, I assume, local artists and a third wing was devoted to the gift shop. The funny thing about traveling is that you notice little things that make each area stand out. Not necessarily good or bad things, just things. I always knew when we were in the West Bank by the water tanks on the roofs of houses and it was obvious we were in Bariloche when we always saw St. Bernard’s with barrels that said “Che” or “Jose” around their necks. But with Ushuaia, you know you’re in Ushuaia when you look in shop windows and all of the mannequins have penguin heads. Which makes everything a little funnier, including this little set up in the gift shop. The snowstorm worsened overnight, and after a little bit of sunshine it went back to snowing even harder the next day. So don’t be fooled by the pictures with clear skies. As always, we seemed to make a dog friend while traveling, this darling husky is Crem, the dog who lived at our hostel. The cold weather didn’t at all phase him and he was happy to hang out outside for most of the day. So this is actually a really cool sign. One of the arrows points north and says that we’re ten thousandish kilometers from the US (five thousandish miles). It also has arrows pointing towards Israel, Chile, Japan, Antarctica etc. I was super excited to take a picture with it, and then the snow semi-ruined my plan. So I still took a picture with it, but you’ll just have to trust me on what it actually says. As I said, the snowstorm did get worse. 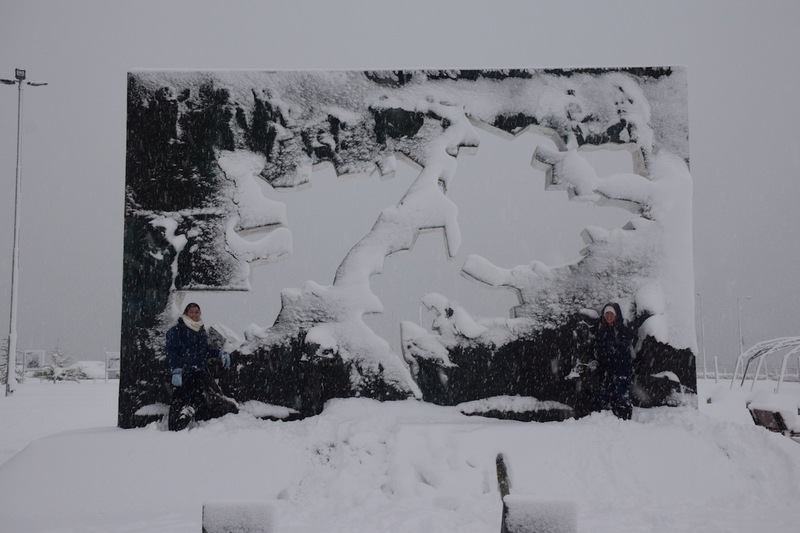 So we returned to the Ushuaia sign to take more pictures, now that it was covered in snow. Despite wearing snow boots, it was still very slippery, so instead of taking a nice picture with the sign, I ended up flat on my back in the snow (the first of quite a few times). I retook the picture to get one of my standing, but this just so much better captures everything that was going on. We decided to explore town and walk to the ice rink to see if we could at least ice skate and along the way we found a few treasures, including this awesome time capsule. Inside it, on a bunch of DVDs, are stories from Argentines as well as like, two months of newsreels. It’s supposed to show the history of people in the past and will be opened on October 2, 2492. Pretty awesome, right? As I mentioned, Las Malvinas are a pretty big deal here, since they are quite close to Ushuaia. As of a few years ago, boats that visited Las Malvinas weren’t allowed to dock at Ushuaia, I think the restrictions have loosened a little since then. That doesn’t mean the people don’t feel very strongly about ownership of the islands! In addition to a few pieces of graffiti on the walls, this monument stands downtown next to an eternal flame and a wall of names, honoring those who fell in the conflict. Underneath the snow at our feet is an Argentina flag, I believe it claimed the Malvinas for Argentina but I’m not sure, I only got a quick look as we were driving away. This ship was brought to Ushuaia from the US awhile ago and they brought it back to celebrate the two hundred year anniversary of Argentina. It’s half sunk into the bay so this is its permanent resting place. It’s not actually that far away, it was just snowing really, really hard. 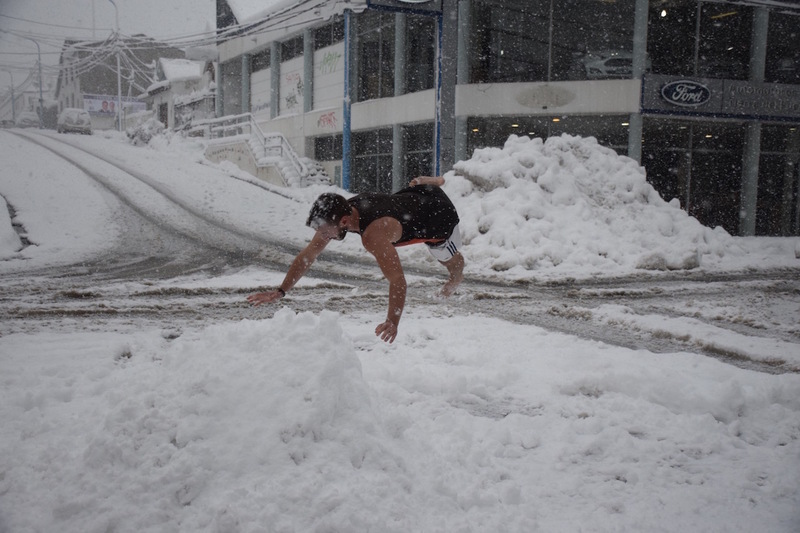 Then of course, there’s always how the Argentines celebrate the first big storm in Ushuaia. We came back to the hostel to find some of the staff building a giant snow pile, just like we might build a leaf pile, and diving headfirst into it in a tank top and shorts, without shoes, and then racing inside to warm up again. #datcitylyfe: Tierra del Fuego means “Earth From the Fire” literally, I think a closer translation would be Fire From Earth. The story behind the name is that when the first ships who discovered and named the place came by, the natives were all burning a ton of wood to scare the ships. Because the natives had never seen ships before, and the ships had never seen a seemingly empty land burn. Hence, Tierra del Fuego. Like much of Argentina, Ushuaia doesn’t really have any stop signs. All of the intersections are first come, first cross. Which is fine, until you get super snowy and icy roads. We didn’t see any crashes, but I really can’t imagine that they don’t happen.